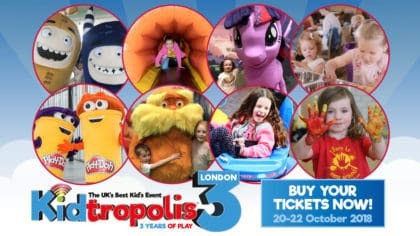 Check out Kidtropolis at the London ExCeL this October! Kidtropolis is one of the coolest events on the calendar and it’s back for its third year! If you’ve never been before, it’s basically an epic event packed full of live shows, cool characters, exciting entertainment and amazing activities. It’s at the London ExCeL on the 20th to 22nd October 2018 making it the perfect October holiday activity. There’s live shows, awesome exhibition stands, a massive inflatable assault course, and we’re going to be there! You’ll be able to hop on the special Fun Kids bus which has a built-in radio studio. You can practice being a DJ and you might even be broadcast across the whole of the UK! Best of all, your ticket includes access to everything Kidtropolis has to offer! The things at the London show may vary. Make sure you check the website to find out what’s on. All activities are subject to terms and conditions and availability. « Discover the world of ballet at the Royal Opera House!